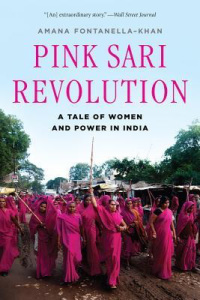 Pink Sari Revolution: A Tale of Women and Power in India by Amana Fontanella-Khan | Cupcake. There is a female ‘gang’ to be reckoned with in India. This ‘gang’ is known as the Pink Sari Gang comprised of numerous women serving females in need of assistance and/or support. Their formidable leader and founder, the memorable Sampat Pal. The book explains the flagrant corruption in politics and law enforcement, the ill treatment of women, and the poverty suffered by provincial citizens. These deep rooted issues have been plaguing India for some time, nothing new to the reader or anyone aware of India. « Rede Nami-“a Feminist Network using the Urban Arts to promote women’s rights”.